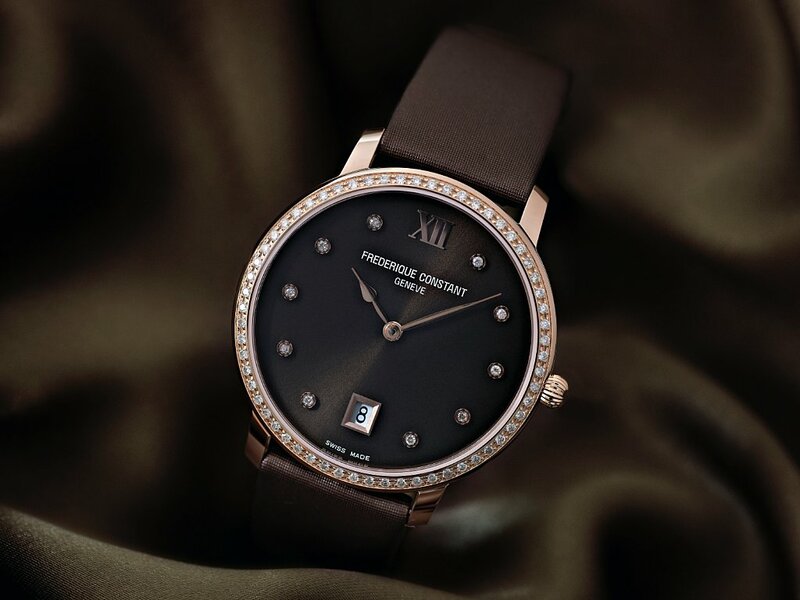 For 2013, Swiss luxury watch brand Frédérique Constant is introducing the all-new Slimline Joaillerie Collection, a set of utterly unique watches designed purely for Women. Each of the new Slimline Joaillerie models—the Chocolate, the Mother of Pearl and the Grey- share a number of features. As the Slimline name implies, this collection is beautifully delicate in appearance. Each model is a mere 5.18mm thick (or less than one-quarter of an inch), and the cases are all plated with gleaming rose gold. Surrounding the 37mm diameter case are no fewer than 60 shining diamonds set in the bezel; one for every minute of every hour. As if that weren’t enough, another 10 diamonds are set by hand in the watch face as hour indexes. A date display is at the 6 o’clock position; hand applied Roman numeral indexes mark the 12 o’clock position, and each watch’s hour, minute and date functions are controlled by the FC-220 caliber movement. Finally, each watch strap is fastened by means of a rose gold plated tongue buckle. The Slimline Joaillerie Chocolate model is deliciously perfect; the watch’s dial is a rich, dark chocolate in colour, with an enchanting sunray decoration bringing a warm appearance to the face. The sleek, glamorous satin strap is also chocolate in colour, completing the “delight by chocolate” experience. The Slimline Joaillerie Mother of Pearl, on the other hand, features a gleaming white dial. The lustrous mother of pearl face is the ultimate in elegance, and the mother of pearl color of the satin strap is chic in the extreme. Completing the collection is the Slimline Joaillerie Grey, a watch which clearly proves that understated glamour never goes out of fashion. The watch dial is grey-black, with the same, fine sunray decoration applied to the face. The grey satin strap is gloriously good-looking.